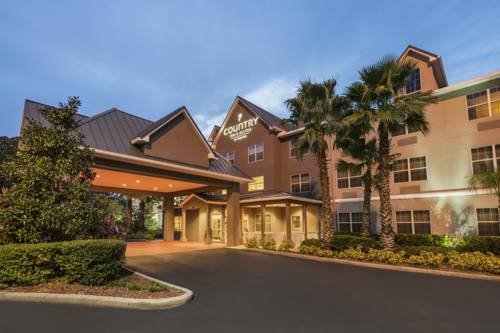 Country Inn and Suites Tampa East is near I-4, I-75, US-301, Lazy Days RV, Hardrock Casino, FL State Fairgrounds, Amphitheatre, Busch Gardens and Tampa port. Hotel is minutes from Sabal Industrial Park, University of South Florida, Verizon, Telecom Park, Hidden River, Moffitt Cancer Center, VA Hospital, Tampa Convention Center, Ybor City, Raymond James Stadium and St. Pete Times Forum. This hotel features complimentary wired and wireless Internet, business center, fitness center, Hot Buffet Breakfast, 32 inch LCD HDTV, 100 plus channels cable, Serta Elite Pillow-top Beds, Fresh Baked Cookies, Pool and more. Our hotel is 100 percent non-smoking. Guests with disabilities requiring a special room, please contact the hotel direct prior to arrival to confirm a room that best accommodates needs. Well behaved, groomed pets are allowed in designated pet friendly guest rooms for a fee of 25 USD per pet per night. A chain of Old Country Stores that combines a retail store and a restaurant serving traditional Southern comfort food. Serves breakfast, lunch and dinner featuring classic country gifts, collectibles, games and packaged homestyle foods. Any way you want it & any time - from burgers to benedicts. Whether it's breakfast, lunch or a casual dinner. Casual neighborhood dining chain serving moderately priced food and beverage items. Full bar open late till 2AM. An Australian Outback themed restaurant serving American cuisine, with Creole influences. Hip fine dining with live entertainment on Friday and Saturday. Breakfast room with 750 Sq. Ft space and holds small meetings and events up to 35 Guest Capacity is available after 11 AM.